Setting up official National Ag Day Activities Tuesday in Washington, DC, Agri-Pulse is holding a Farm Bill Summit today, part of their on-going Farm Bill Series. Over 400 industry representatives, congressional staff members, and invited guests are gathering for the day long event that features farm bill veterans and policy experts discussing the road that lies ahead for the 2018 farm bill negotiations. Sponsors include the American Farm Bureau Federation, American Sugar Alliance, Association of Equipment Manufacturers, Farm Credit, National Council of Farmer Cooperatives, National Crop Insurance Services, Specialty Crop Farm Bill Alliance, FLM+, National Association of State Departments of Agriculture, CropLife America, National Farmers Union, and Environmental Defense Fund. 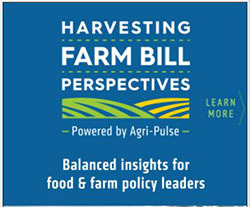 Watch the Twitter hashtag #FarmBillSummit today and watch for our coverage of the event on AgWired.